How did you arrive at Lovin’ Spoonfuls? Tell us about your background! How did you become interested in food rescue? My parents were both artists and raised me with somewhat of a hoarding mentality, as there were few material objects they did not find value in. Everything, big or small, had their use and re-use, and waste was rare and unfortunate. This attitude wasn’t to my knowledge born of a conscious devotion to the environment: my mom, who grew up during the Chinese Cultural Revolution in Beijing, was taught to be resourceful, while my dad, naturally resourceful and raised near Berkeley, California (as was I), valued a life of material modesty. This went hand-in-hand with their artistic bent, as many of my dad’s saved objects went toward his artwork. My dad ran a small cafe in San Francisco to supplement his art and cooked creatively at home, inspiring me as a teenager to do so for fun. He taught me to find great satisfaction in “not wasting a drop,” collecting the final streaks of ice cream from the carton and the lingering smears of pasta sauce from the pan and enjoying the heck out of it. His favorite invention was the rubber spatula because it could so pleasingly capture every bit of residual food. I developed over the years some arguably annoying habits around food: an inability to eat faster than a slug because of my desire to fully savor each bite; a tendency for leaving two bites of something in the fridge with the assumption that it will create great enjoyment for someone at a later time; an overly ambitious enthusiasm to eat questionably edible food to prevent it from going to waste. I went to college in Vermont to study visual arts, and there, encouraged by my dad to give it a shot, discovered a love of farming. I didn’t begin to embrace or consciously identify my passion for sustainability and conservation until I graduated, however, which evolved during the typical post-college freakout and a road trip back across the country toward California, in which I was appalled by the amount of waste of all sorts that I saw at hotels, restaurants, and tourist destinations. But what became a source of constant frustration during my first year in the “real world” was the food waste I saw all around me—and perhaps even more disturbing than the waste itself: the blasé attitude with which perfectly good food was tossed. I couldn’t understand how food (in my opinion the cornerstone of cultural, emotional, and physical wellbeing) was proving to be so undervalued. So I did some research and had a mini heart attack of relief when I discovered that organizations existed to not only rescue unloved food, but also connect that food with people who needed it. Lovin’ Spoonfuls was one of the organizations that I researched with admiration, though I had no plans of moving to Massachusetts. 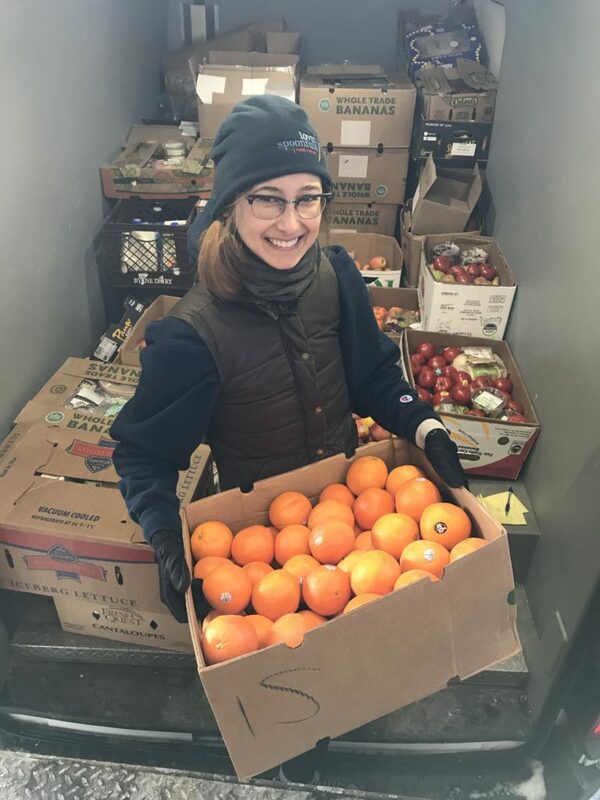 I volunteered with a Los Angeles-based food rescue organization that year, and through the next several years, dipped my toes in food justice non-profits of varying models and approaches—including Mill City Grows in Lowell, which brought me spontaneously to Boston in 2017, and Boston Area Gleaners. The more I learned about the complexities surrounding food security, the more invested I became in advocating for the power of food. I hope to deeply root myself in food rescue with Lovin’ Spoonfuls! Have there been any surprises for you in the food you rescue? I have been surprised at how routine it is for food to be rotated off the shelves well before their sell-by date arrives. I have an issue with expiration dates, as these arbitrary numbers cause an incredible amount of food waste—but seeing that food is tossed even when these dates are days away, is eye-opening. I do love to cook and particularly to experiment. To tell the truth, following a recipe is no fun for me at all because it reminds me of high school chemistry, so I’ll usually do different iterations of something I like, such as various stuffed, roasted, and balled things. I currently have hummus, a stir fry made with leftover produce, leftover shakshuka and roasted veg made from rescued produce, and banana muffins made from rescued bananas! Every year for Russian Easter, my dad and I would bake about 15 loaves of a spicy, bright yellow Russian cake-bread that involved alarming proportions of cardamom, nutmeg, saffron, vanilla bean, and rum. It was a three-day process to make Kulich, during which we would tenderly wrap and tie our cauldron of dough (which weighed probably about 70 lbs) in a comforter and let it sit by the heater to rise, then destroy any progress the yeast had made by dumping a gallon of rum into it. We would use Quaker Oats cylinders as forms to bake the Kulich in, and your seniority (or perhaps more so, your literal physical mass) within the extended Martin family was illustrated by how large your cylinder of Kulich was. My dad 🙂 He embodied so much of what I know to be beautiful, wholesome, and inspiring.